1kg Raw Organic Cacao Nibs. 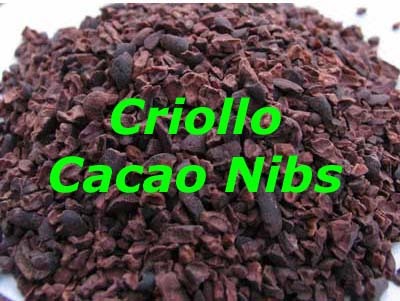 Our cacao nibs are of Creole variety, and from Peru. Creole variety is called "The Queen of Cacao" as it produces the highest grade beans. Creole cacao is an ancient variety, non-hybrid, produces "fine and flavor" beans, are the scarcest, most expensive and the most highly regarded for their complex flavour and aroma. Only a fraction of world cocoa production comes from Creole trees, as they are delicate, low producers and susceptible to certain disease. For more information, please visit Cacao Nibs information page. To get desired health enhancement it is recommended to consume 28 g/1 oz (approximately 2 tbsp.) of Cacao nibs per day. Our Cacao nibs are easy to eat on their own or blended with smoothies, shakes, coffee and tea Try the nibs with ice cream and desserts. Nutritional Information: Per 100g: Energy 2417kj/577kcal, protein 9.6g, carbohydrate 22.47g, fats 48.15g.